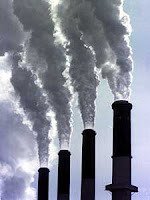 Have you heard the debate about the new Mercury and Air Toxins rule proposed by the EPA? This rule would reduce the amount of mercury that power plants can put out by 90%. The technology exists and according to Lisa Jackson of the EPA, 50% of our coal power plants already have this technology in place and are using it. Clearly it’s affordable and Lisa argues that this rule will increase jobs, because someone will have to produce these scrubbers. Click below to hear what Lisa has to say in her own words on The Daily Show. This interview is short, clear and understandable. Over 400,000 newborns are affected every year by mercury and these standards are expected to prevent 17,000 premature deaths and 11,000 heart attacks every year. Do you want to help? Mom’s Clean Air Force has information on how to express your support to the EPA. Options include click & send, how and where to send your own letter, and how to get involved promoting this issue. The EPA is also working on a rule that will limit mercury and air toxins for boilers. This standard is more complicated so they are reviewing this rule further internally, before proposing it. When it is announced, it will need our support too. There is a huge amount of corporate money opposing these rules and it will take the voices of individuals in our country being heard supporting these rules for them to go forward. Environmentalism isn’t a spectator sport. You actually have to stand up and demand that we be vigilant in protecting our air and water. Show your support by contacting the EPA to show your support on these rules. Our government is for the people and by the people so please help us make sure it hears the people. Go to Mom’s Clean Air Force to let your voice be heard on this vital matter!